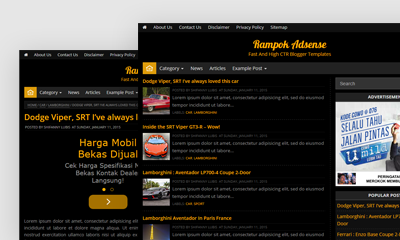 Rampok Adsense is a blogger template with responsive layout and two style column. This is the high user friendly blogger template, because the design od this template is very simple and clean. Actually perfect for News, personal websites. If you have the google adsense account, you can publish the adsense script in this template, and you will get many earning in every month. If you buy this template, you will get two style color in one pack.